Find a vet who can help treat your dog's osteoarthritis. Find a vet near you who’s currently using LTCI to treat OA. Can’t find one? We can send you info to help your vet learn about this revolutionary treatment aid. When it comes to seeking treatment for your pet, not everyone knows exactly what to say to their local veterinarian. We've provided this downloadable PDF, allowing you to print out the info about LTCI that your vet will understand. Just click on the link below, print out the file, and bring it (along with the order form below) with you to your next appointment. LTCI is available in both 3 and 10-dosage packs, but is only able to be purchased and administered by a licensed veterinarian. You can download this order form, print it out, and provide it to your local vet so they can quickly and easily order the dosage that's right for you and your feline companion. Your new treatment option is just a click away. 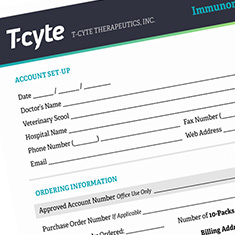 Lymphocyte T-Cell Immunomodulator has received a conditional license from the United States Department of Agriculture (USDA). Additional efficacy and potency studies are in progress. 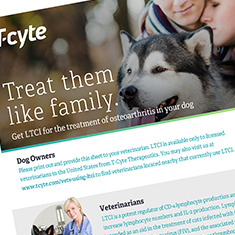 LTCI is manufactured and distributed by T-Cyte Therapeutics, Inc. Orders are restricted to licensed veterinarians only. Please contact your local vet for pricing information. © 2019 T-Cyte Therepeutics. All rights reserved.